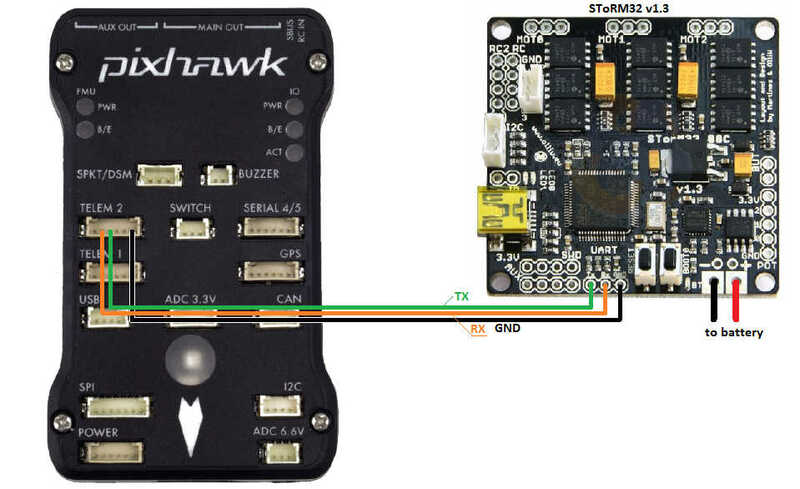 The STorM32-BGC is a relatively low-cost 3-axis brushless gimbal controller that can communicate with ArduPilot (Copter, Plane and Rover) using MAVLink. With 3-axis control and MAVLink interface, the STorM32 offers more capabilities and than the Tarot Gimbal. MAVLink is a richer communications format that PWM and may be used in the future to provide additional information to the gimbal including centrefugal force corrections leading to better performance during aggressive maneuvers. Please refer to the STorM32-BGC wiki pages for more detailed information including where the gimbals can be purchased. This gimbal has been tested with a DYS 3-axis brushless gimbal. Support for this gimbal is included in Copter 3.3 (and higher) for gimbals running v067e (or higher). 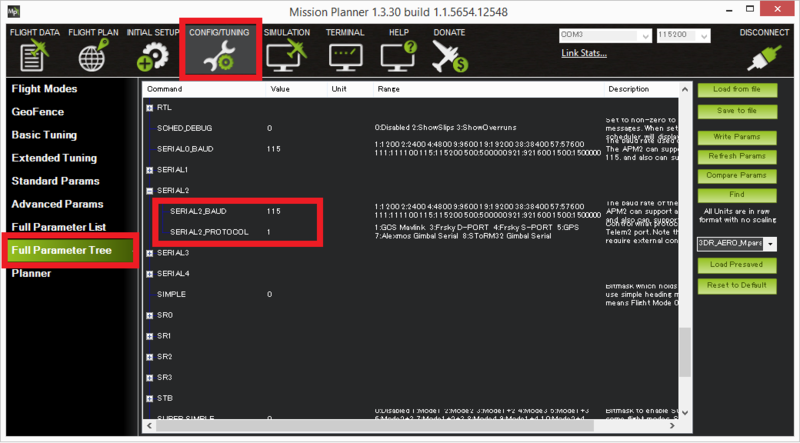 You will need to solder 3-pins of a DF13 6-pin cable to the gimbal controller board as shown above and then plug the other end into one of the Pixhawk’s Telemetry ports (Telem1, Telem2, Serial4). The remaining 3 pins (VCC, RTS, CTS) of the cable should not be connected. 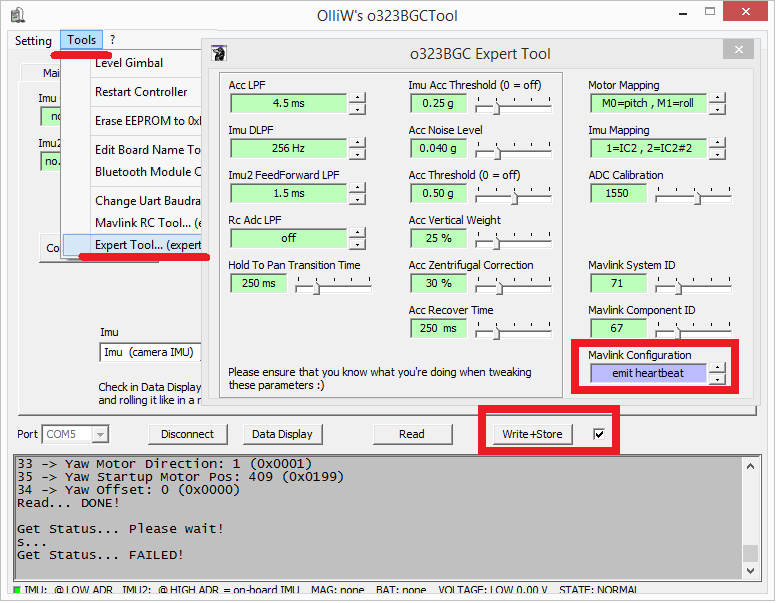 In addition to the regular gimbal configuration described on the STorM32-BGC wiki, the MAVlink heartbeats should be enabled through OlliW’s o323BGCTool’s Tools | Expert Tool screen as shown below. 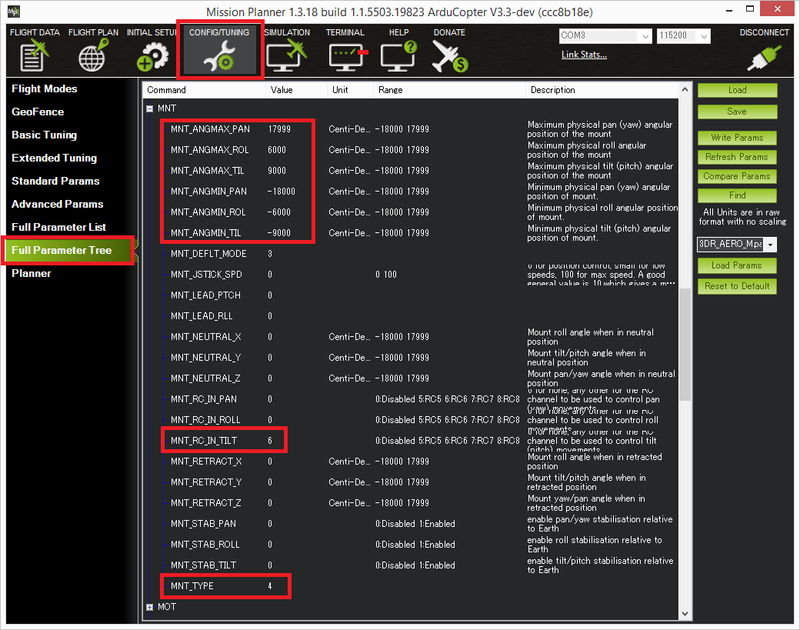 Set MNT_TYPE to “4” to enable the STorM32 gimbal driver (the Pixhawk must be rebooted for this change to take effect). Set MNT_RC_IN_TILT to “6” if you wish to control the gimbal’s tilt (aka pitch angle) with your transmitters ch6 tuning knob. For instructions for testing the gimbal moves correctly please check the similar section for the SimpleBGC gimbal. The video below shows the STorM32 being tested on Copter3.3. It demonstrates a few features that would not be possible on a 2-axis gimbal like the Tarot Gimbal. 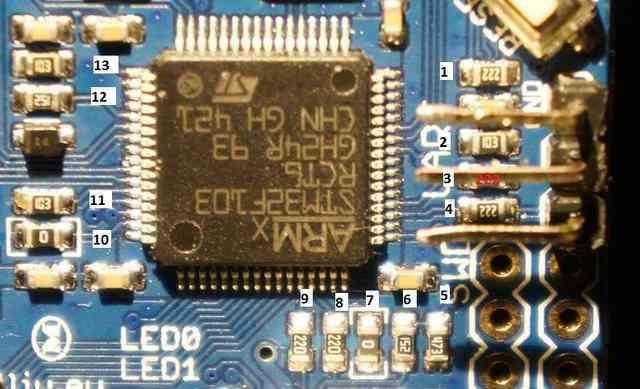 Some in-depth analysis here on rcgroups turned up that some STorM32 boards need resistor #4 (shown in pic below) shorted (i.e. a wire soldered over the top of the resistor to turn it into a regular wire) in order for the gimbal controllers messages to get through to the Pixhawk.